You’ve been waiting so patiently and now Kidrobot is here to help ease the pain… so Chris Holt aka The Toy Viking is here to tell yo u the tale of the new Arcane Divination Mini Series releasing today officially on Kidroot.com. You rush with the urgency of being chased. Through crowded streets you dart in between people who seem to melt away as the rain batters your eyes. Your destination remains a mystery but your journey is anything but; you seek answers. Suddenly you’re brought to a stop by an unknown force,and you look frantically trying to figure out what it is you’re to do. To your left a busy street filled with the noise of impatient engines and headlights that refract from the downpour. To your right you see your destiny: a basement shop that looks completely abandoned except for a neon crystal ball that flickers in an attempt at life. You push open the door and enter a room that is void of any discernible light source yet you can plainly see everything it contains. There is a table and two chairs, one of which is occupied by a woman older than any human has the right to be. The other is empty and as she motions for you to sit it slides slowly towards you. After sitting down you hear the first words of the entire day that haven’t been inside your own head. 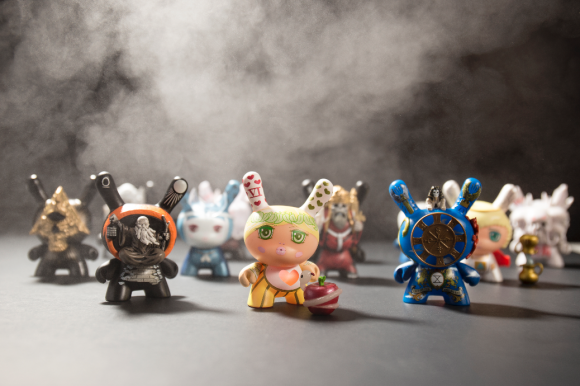 Kidrobot thins the veil between our world and the spirit realm with the Arcane Divination Dunny series. Curated by J*Ryu and featuring his work alongside that of Jon Paul Kaiser, Camilla d’Errico, Godmachine, and Tokyo Jesus, each figure is inspired by a different card of the tarot. The result is a celebration of the esoteric and a journey into a world for which there is no turning back. Sold blind boxed, the figure you get will be as much a surprise as the answers they hold. Like the cards they represent, they are more powerful together than apart, so start your collection today at www.kidrobot.com. But be prepared, for some doors can never close once open.